A. The rear brake only. C. The front brake only. The brake works by slowing you down using friction. Different types of brakes have different braking capacities and durability. A brake with a cross-drilled rotor with larger pistons like the one pictured above will have superior cooling ability and more surface area to dissipate heat in order to resist brake fade. 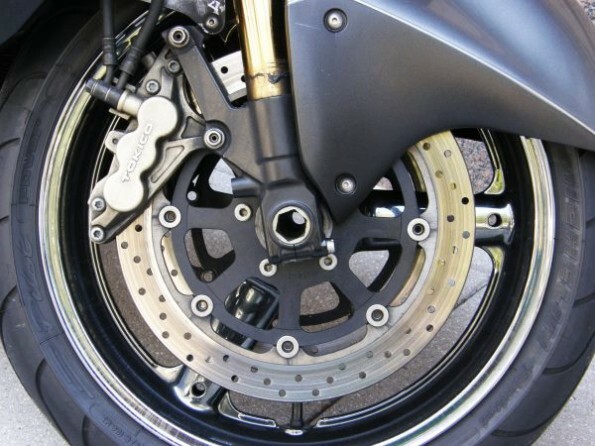 On a motorbike your front and rear brakes are usually operated separately (some bikes and scooters have linked brakes). As you brake, the load shifts forwards putting more friction on the front tyre. This means it also reduces the load on the rear tyre making it more difficult to brake with the rear wheel (this is why when you have a pillion passenger you can use more rear brake because there's more weight over the rear). The quickest stops are made without locking the wheels (skidding), and using both brakes together. If you just use the rear brake this will take the longest to stop. If you just use the front brake you will stop quite quickly, but not as quickly as if you use both brakes together. Apply the front brake just before you apply the back brake to shift the weight first, otherwise if you use the back brake first then the front, the forwards shift of weight can cause the rear wheel to become unloaded and the wheel can lock more easily. Normal stops should still be made by using both the front and rear brake. The rear brake can still be quite powerful and on a cruiser, where more of the weight is positioned over the rear, it is more important. 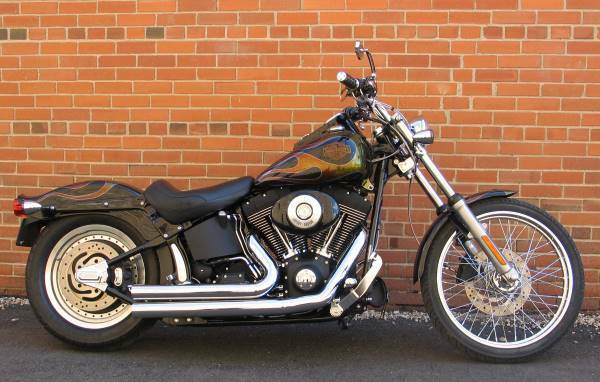 As you can see in the photo below, the rear brake on this motorcycle is of a substantial size. The complete stopping distance comprises the reaction time and braking distance. The usual reaction time will be between 1-2 seconds. At 50kph this is 14-28m - this is why you need to adjust your following distance as if you are close to the vehicle in front and it has to stop quickly you could run into the back of it before you even have time to apply the brake. When you are braking you need to do it in a straight line. Braking while turning puts much more stress through the front tyre because it has to deal with two sets of forces. Your bike will be much more stable if you get your speed right before you turn in, then use a small amount of throttle through the corner to keep the bike balanced. Downshifting shifts the balance of the bike temporarily and therefore should be done before the turn so that you are in the correct gear while in the turn. The higher the revs are when you downshift, the more engine braking you will experience, and this makes it easier for the rear wheel to lock. Be careful not to over-rev the engine as you downshift. You can smooth your downshifts by matching the revs using the throttle, and this makes it less likely to lock your rear wheel. This video explains the braking procedure on a motorbike. If you see a slippery surface ahead such as sand or oil, brake as much as you can in a straight line to reduce your speed as much as possible. If you end up on the slippery surface release the brakes, don't make sudden movements and let your engine do the braking for you (remember to change down into an appropriate gear). If you have to brake more, do so gently and use your feet as outriggers for extra balance and to keep yourself upright.